Upon the precipice of the Great “Recession”, US workers were cushioned to some extent by what economists call sticky wages. Before the Great Depression, as well as during it, companies would attempt to deal with looming economic contraction by cutting pay rates before workers. Nowadays, the intent is reversed; businesses will try to keep core workers by keeping pay rates as steady as possible while instead shedding extraneous employees at potentially a furious pace (see: 2008-09). 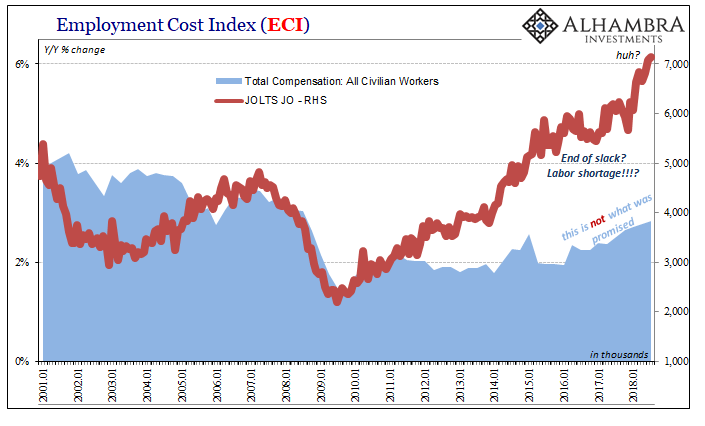 The Bureau of Labor Statistics’ (BLS) Employment Cost Index (ECI) captures sticky wages pretty well. In the fourth quarter of 2007, just as the contraction was beginning, that measure of labor costs rose 3.3% year-over-year. That was down only a bit on average, where costs were growing at about 3.6% since the dot-com recession had ended. Even as the contraction gained momentum, the ECI kept growing at least 3% until the worst of it. Even though the unemployment rate had jumped from 4.7% to 6.1% by the time of the panic, employment cost growth remained pretty stable. It wasn’t until the monetary deluge in Q4 2008 that wage rates finally stalled. They never really contracted, at the lowest it was still +1.4% by the end of 2009 toward the end of the mass layoff period. Sticky wages work in the other direction, too. Salary increase rates will stay low until business factors shift substantially. These tend to be cyclical and macro. This is the fuss about the unemployment rate. 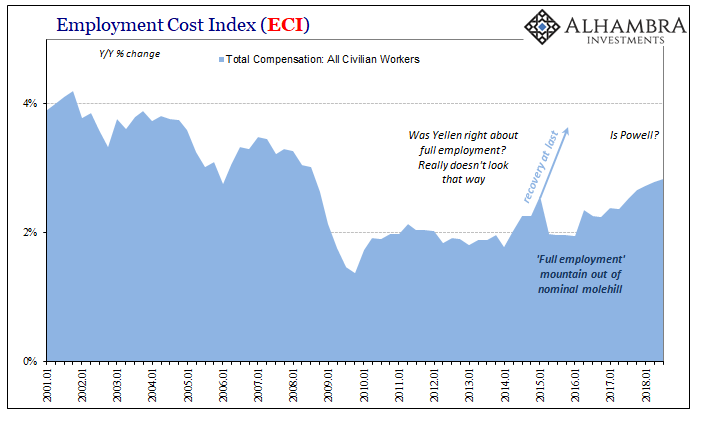 A tight labor market can shift employment costs; an extraordinarily tight labor market should shift employment costs. According to the latest figures from the BLS, the ECI increased 2.83% year-over-year in the third quarter of 2018. This was the largest gain in aggregate employment costs since Lehman Brothers and AIG. And that’s what has been broadcast over and over today; the highest in ten years! But 2.83% is still tepid, that’s the reality. If the ECI increased 3.02% during the very same quarter as Lehman and AIG, nine months into a pretty substantial contraction to that point, what is 2.83%? It sure doesn’t indicate a tight labor market, it’s not even that good. There isn’t even much to indicate that this so-called tight labor market is accelerating the trend. In the first quarter of 2015, the Employment Cost Index jumped to 2.57%. It appeared then consistent with the dominant narrative about the “best jobs market in decades.” And then, nothing. It would take until the fourth quarter of 2017 before the ECI would finally surpass that one to become the highest wage gains in years. The index grew by 2.66% in that particular quarter as the unemployment rate fell to just above 4% (getting to 4.1% in October 2017). Since then, over the next three quarters including this latest one, the ECI has increased 2.71%, 2.78%, and now 2.83%. Each one has been the highest in years, celebrated every single time that way, but still materially less than the third quarter of 2008 halfway through the Great “Recession.” This is not the trend for an extraordinarily tight labor market. It’s not even a tight labor market. If the LABOR SHORTAGE!!! is going to make the Fed more aggressive, then it’s absence among potentially corroborative sources would do what? The Bureau of Labor Statistics (BLS) reports that the Employment Cost Index (ECI) rose 2.78% year-over-year in Q2 2018, the highest rate since 2008. That’s the good news. The bad news is that it rose by 2.78%. Five basis points on top of last quarter is an uninspiring result. This sustained, sticky trend reminds yet again of the difficulties for mainstream labor statistics in measuring accurately underlying conditions. The contrast between the ECI and the BLS’s JOLTS data, for example, illustrates exactly these problems. Officials prefer the one set because why wouldn’t they. It is emotional rather than honest analysis, the latter would require acknowledging the clear lack of corroboration where it should be. According to JOLTS Job Openings (JO), one data point supposedly reflecting the demand for labor, American business is through-the-roof. Job openings had declined modestly to 5.7 million in December 2017. The latest estimate for August suggests there were 7.1 million. That’s acceleration, only without corroboration we are left wondering what the source of it might really be. There wouldn’t be any doubt if it was real. This disparity isn’t a new one, as you can see on the chart above. By all accounts, the labor market remains under constraint. Wages are sticky, and since 2008 we know what that means. The highest in ten years just doesn’t mean what it is supposed to. It’s the number ten that is misleading, often intentionally. The highest in twenty years, that would be something. Fastest in thirty years would be finally close enough to the rhetoric about this LABOR SHORTAGE!!!! Unfortunately, as the latest figures confirm for yet another quarter, the economy isn’t anywhere close to either of those levels.  It still can’t beat the Lehman quarter even after an entire decade and everything done with this one purpose in mind. This is the true headline.